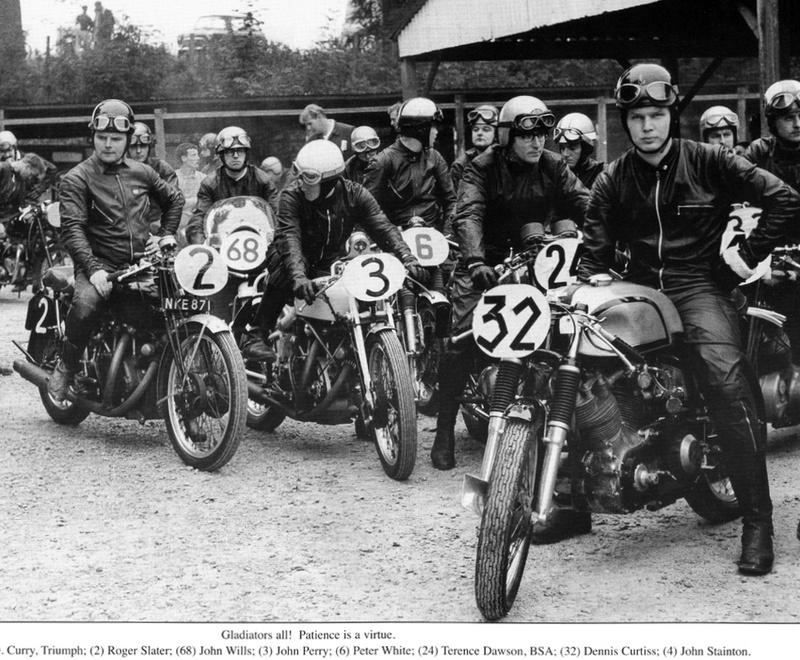 Denis Curtis started to race in 1965 on a stock BSA 350 Gold Star that had been lent to him by a friend. 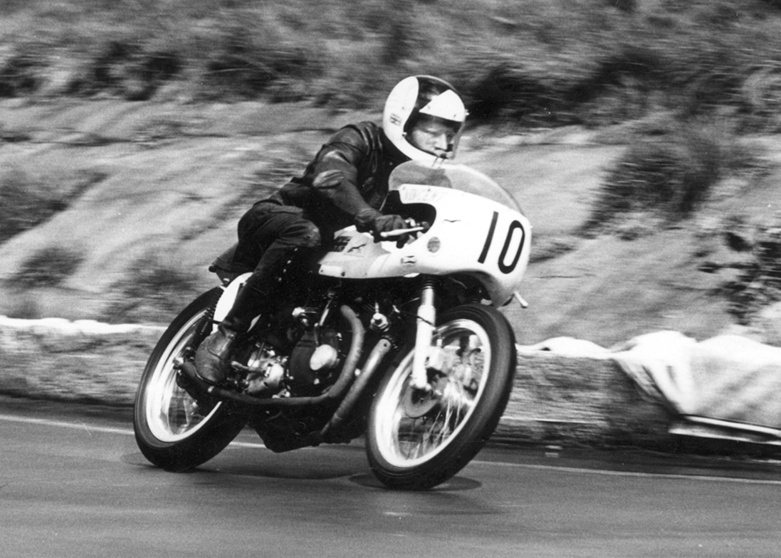 Like many at that time, Denis often rode the bike to Cadwell Park, Lincolnshire, taped-up the lights, added number plates and went racing. As he was only 16 years old, his mother had to sign a waiver, leaving his father out of the secret. But Denis also had another secret; a plan to build his own racing bike, a Vincent special to compete in the Clubman Open class in the UK championship. The project began in 1965, while Denis was an apprentice at Jig and Tools Design at Lincoln. His vision was not to make as a classic Norvin, but rather in a way to use the most of the original racing bike to make it more competitive. Thus was born the concept to replace the Manx engine with a Vincent V-Twin, built on the exact crank centerline of the Manx, for better weight distribution and ease of maintenance (valve clearance adjustment, etc.). Consequently the Vincent twin unit had to be chopped to remove what was not necessary – the swinging arm anchorage, the primary transmission case, dynamo mounting and gearbox in order to mate it to the Manx 4-speed gearbox/transmission. The frame also had to be heavily re-engineered. The front down rails were removed to suspend the Vincent engine from plates attached to the steering head and boxed-in for strength (1). Completing the picture was the upgraded engine to the Black Lightning specification. 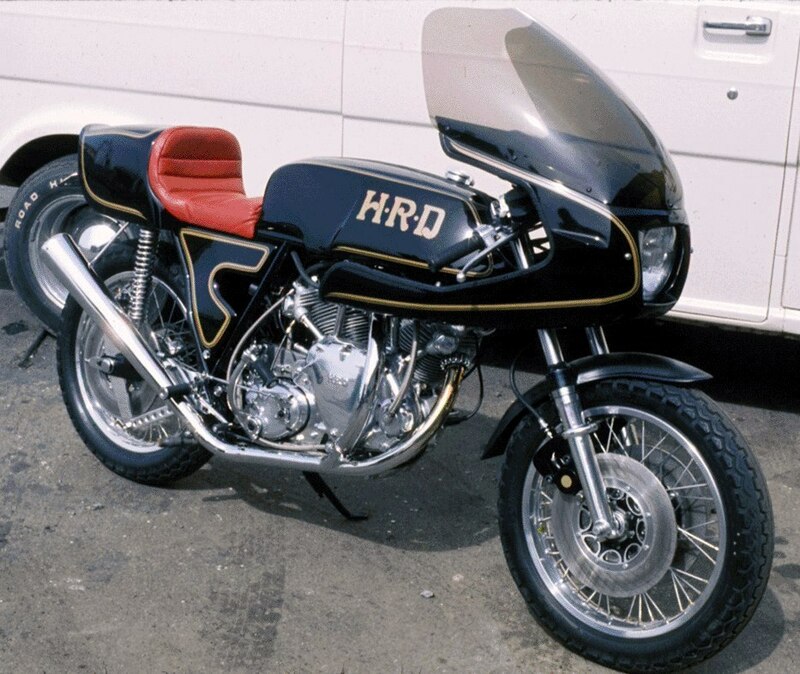 Once the project completed in 1967, Denis raced the bike himself for the first season and subsequently sponsored Martin Bland for a couple of races before selling the bike to Bland. 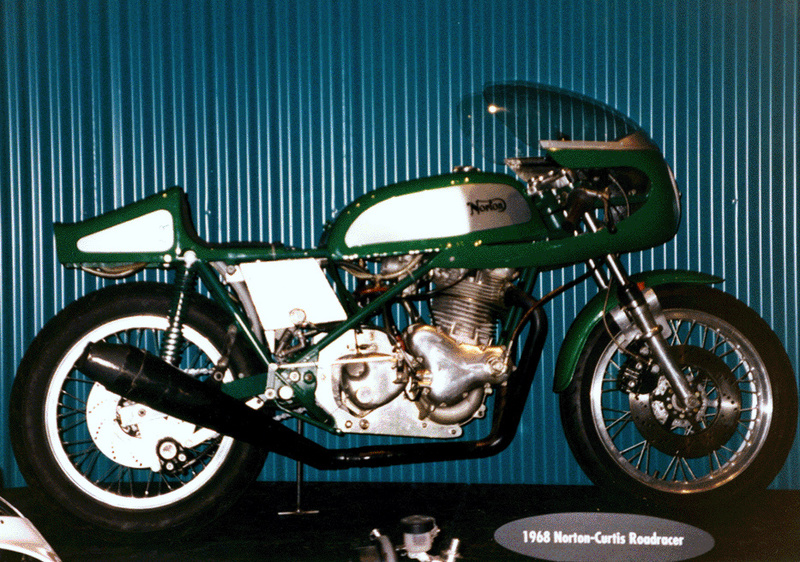 Between 1968 and 1970, Curtis made seven more Curtis-Vincent twin cylinder race and street bikes using Norton frames, but only three of those used Manx Norton frames and cycle parts (2). In all cases, the front down rails were cut out just underneath the Norton steering head. 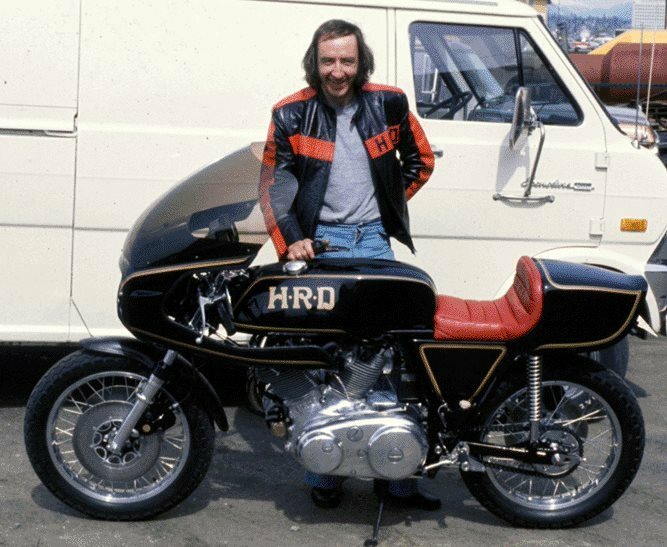 In 1970, Denis emigrated to Canada where he started his own business in 1972 (3) producing frame kits and cast magnesium wheels for both race and street bikes. 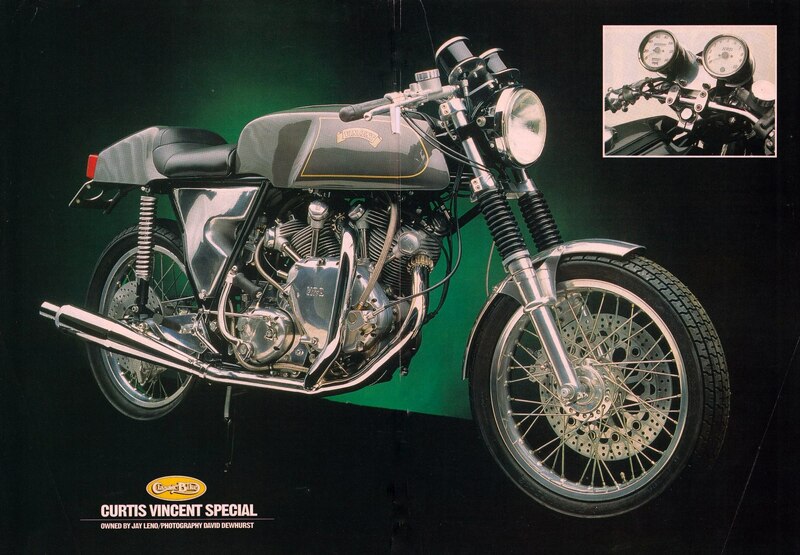 But in 1973, Denis was approached by a customer asking him to make a Curtis-Vincent specially for him as the customer had a spare, chopped twin engine for which he had no use. Curtis accepted the commission and used the same concept as previously, but made the frame and swinging-arm from scratch with 4130 Aircraft Chrome-Moly Steel tube. A total Dennis built five bikes in such style, and all were for chopped engines (4). In 1977, Curtis sold his business in order to focus on other activities. But 30 years later, his new company CMR (5) was incorporated with the intention to resume motorcycle rolling frame manufacture. Several collectors soon learnt that Curtis was producing frames again, and asked him to consider reproducing and updating his Curtis-Vincent concept. Denis accepted the challenge and CMR is currently working on three special orders that we will have the opportunity to feature in the future as the bikes are completed. Would it be a surprise to tell you that all projects are using chopped cases? No, thought not. CMR is now ready to take on more projects, although the core activity is focused on building traditional racing frames for Yamaha 4-cylinder and 2-cylinder, 2-strokes and 15 other classic racing models, which are becoming popular in classic racing circles. Unlike Fritz Egli, who built the frame around the Vincent power plant, Curtis took the challenge the other way around. In essence, carving the Vincent engine to fit it into a Manx Norton frame in order to deploy the cutting edge racing components, brakes and forks of the time. As a result, the racing bike was light, handled well, and was much lighter (like the Egli, and London built Parkin-Vincent) than the standard Stevenage product. Vincent purists have often derided the non-reversible alteration of the Vincent engine. It is certainly true, but at that time it was current practice for racing: Vincent twins were among the fastest power units available until the early 1970s, and were also cheap. Racers, then as now, want the maximum power for a minimum outlay. Hence the slew of specials, in road racing and sprinting, utilizing the 1000cc power plant, harnessed in more modern frames and running gear. Paradoxically, Curtis’ idea today turns out to be a great way to revive the already chopped Vincent engines that are looking for a second life from their repose on the shelves and under benches in garages around the world. Cadwell Park, 1967: Denis Curtis on his Curtis-Vincent #32. This was one of the Vincent Owners’ Club many race meetings at the circuit. Pilots are waiting for the ‘out’. Another famous Vincent name is Roger Slater on #2, later importer and constructer of Egli-Vincents, and veteran West London section member and Parkin-Vincent racer Ken Chamberlin #24, behind Curtis. Photo courtesy of Geoff Preece. 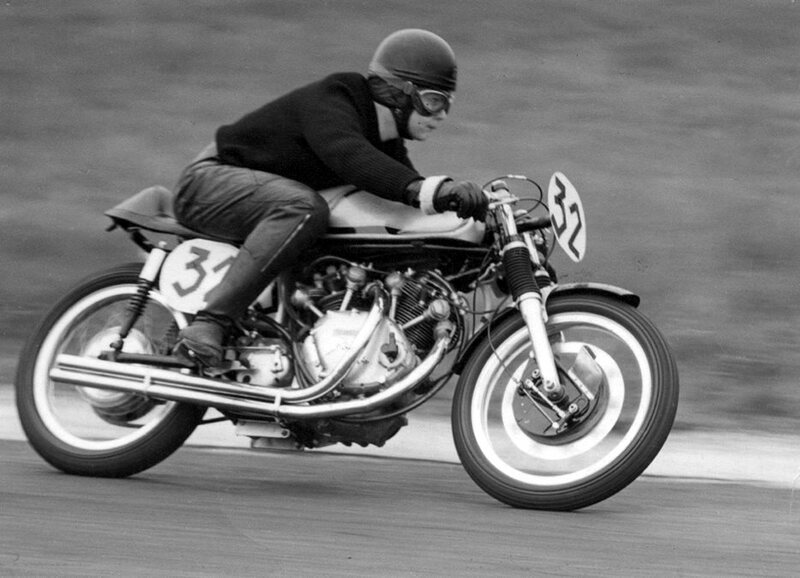 The first Curtis-Vincent Special was raced at Cadwell Park in Lincolnshire in the Clubman Open racing class. The bike uses a 998cc Vincent V-twin engine upgraded to Lightning spec in a Manx Norton rolling frame including its 4-speed gearbox/transmission. Stuart Howe on his Curtis-Vincent in 1972. Stuart was a Vincent sidecar-racing specialist and did a lot of the engine preparation on his bike. Note the Dunstall front fork with built-in calipers. In the mid-70s, there was little demand for Seeley 4-stroke frames but Leif Sorenson, one of Curtis’s employees, wanted to build such a bike, and convinced Denis to do it. The bike featured Betor front forks, Kawasaki brakes and Boyer transistorized ignition; also one of Curtis’ first attempts to build an aluminum gas tank. The Dunstall fairing and front fender, and the Hansen style seat were also made by CFR. This bike, using a 1968 engine, was completed in 1973. Subsequently CFR used the new liquid cooled Yamaha engine although the engine was not at that time available to the public. The bike was designed to use the 18″ CFR wheels in Magnesium, Ceriani Road Race Forks and a cantilever swing arm with 2 shocks horizontally placed right underneath the gas tank. The seat height was extremely low, keeping the rider’s weight as low as possible. It weighed 22 pounds less than the Yamaha Motor Canada bikes of the time. The following pictures show the first Curtis-Vincent made in Canada in 1974/5 for Jim Brokensha from Vancouver. This bike has been slightly modified since and today belongs to Jay Leno. This is the original owner. As with the previous race bikes, the Vincent bloc has been heavily transformed but a Commando gearbox and transmission replaces the Manx units for road use. Here, the frame is not a modified Manx but a tubular backbone frame built from scratch by Curtis. The gearbox and transmission are from a Norton Commando, the gas tank is a Rickman-style, and the seat a Vesco unit. Wheels and brakes are original Honda. A special oil tank was made up to clear the rear carburetor and the fairing and screen were a Dunstall Mark II replicas. 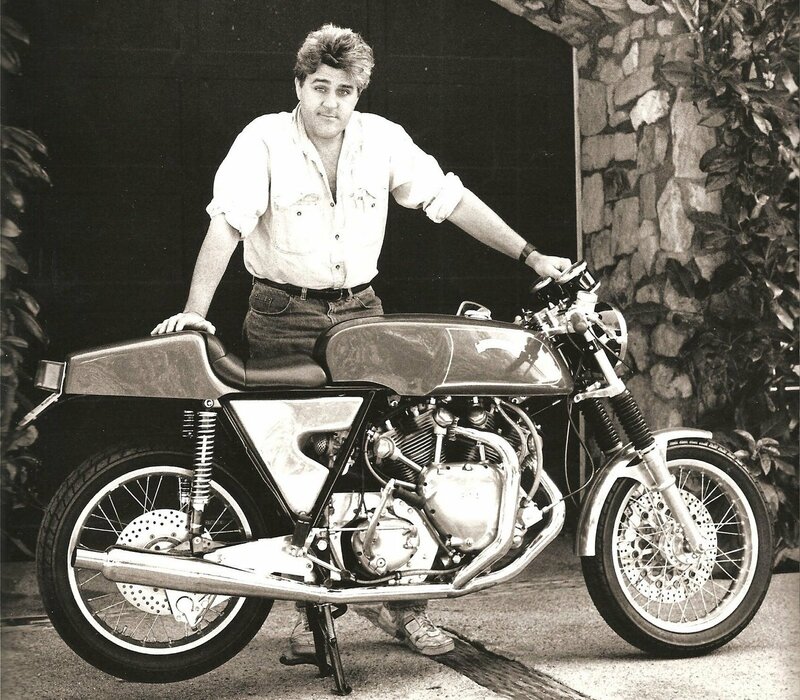 The same bike, now owned by TV personality Jay Leno since 1995. Leno purchased the bike from the original owner in North Vancouver. He made a few changes to the original equipment when he rebuilt the bike. This picture is supplied thanks to ‘Classic Bike’ of the UK (see next picture). The nose cone fairing has been removed, and other parts such the front brake assembly, the exhaust and seat have been changed. The bike as it is known today featured in Classic Bike. Denis Curtis in his workshop at Belleville, Ontario. 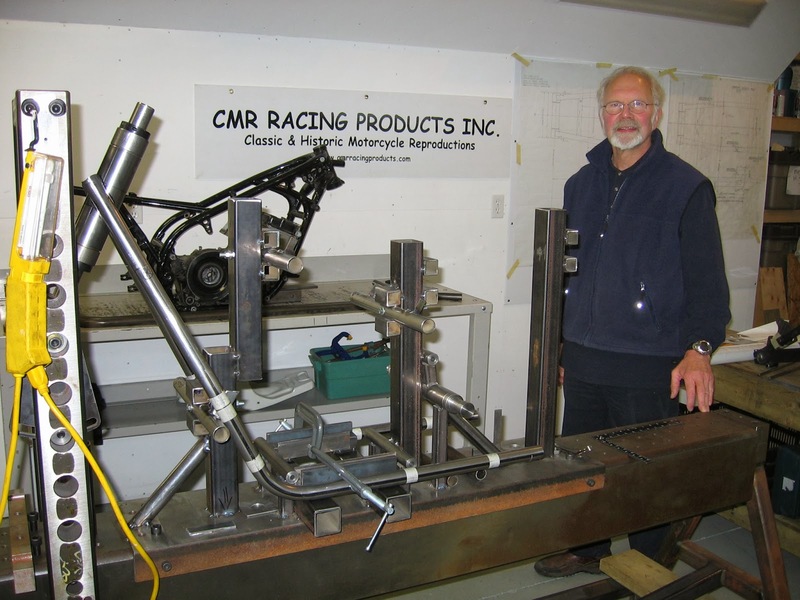 CMR core activity is focused on building classic racing frames for Yamaha 4-cylinder and 2-cylinder, 2-strokes and 15 other classic racing models, which are becoming popular in classic racing circles. Pictures by courtesy of Denis Curtis that I thanks here for his collaboration to this article. Special thanks as well to David Lancaster for his help in this writing. (1) For those who are interested in the details of the frame modification, here is Denis’s description: “In all cases I cut out the front down rails from just underneath the Norton steering head to a point approx. 3 inches from the lower rear frame cross tube (where the lower rear Norton gear box plates attach), and to the rear frame lower cross tube with the complete twin engine. The idea was to place the engine on the same approximate crankshaft centre-line, for better weight distribution and ease of maintenance. The Vincent twin engine, using the earlier B head steadies, was suspended from plates attached to either side of the Norton steering head which were also attached to the frame cross tube just behind the steering head. These plates were boxed in for strength. I ran a tube from the upper rear of the steering head back to a cross tube just above the rear head steady, which I welded into the top tank frame rails. This was a triangulation, and under this cross tube was the rear cylinder head steady mount of similar design to the original Vincent. The rest is easy to see from pictures”. (3) “Curtis Manufacturing and Service Ltd.” in Vancouver B.C.